In Orange County, builders have been constructing homes and office buildings for years. Many older buildings were built with methods which are no longer common in the field of construction. One area in which an owner can find limitations is in the building’s sewer lines. Sewer and water lines get old; they are often made of materials that are no longer used, and in many cases have corroded to the point where they must be replaced. Besides this, external forces (such as earthquakes, new construction, or roots) can damage the piping to the point where the occupants will experience recurring problems, forcing the owner to replace the lines. For a long time now, home and business owners have struggled to deal with the escalating costs associated with replacing faulty sewer lines. After digging the trench, the old pipes must be disconnected, and new pipes must be fitted to the connection at the house and at the municipal line. The process can be a massive undertaking, because one must unearth the entire line, whether it passes under a driveway, trees or shrubs, or even the concrete foundation. The process takes several days and man hours, and is very expensive. Only recently has new trenchless piping technology been developed that enables the owner to make main line repairs without having to excavate the old line. “Trenchless Piping Technology” simply means that one does not need to dig a trench to access the line, and thus the operation necessary to repair the broken line is fast and efficient, and the effects last a long time. By giving the existing pipeline a makeover, the owner saves significant time and money, and gets the best possible mileage out of the existing line. How does it work? Well, when Knight’s Plumbing arrives at your home or office to inspect the pipeline, we send a highly specialized video camera into your building’s piping infrastructure. After identifying and locating any blockages, cracks, and leaks, we will be able to determine whether a trenchless operation is possible, and give you a flat rate quote, right there on the spot. You will be able to assess the damage to your line with your own eyes, and therefore our price should make sense to you. And because we are confident in our ability to provide fast, effective service, we are confident that you will like our offer. Our first step to relining a sewer pipe is to clean the line thoroughly. To do this, we send a hydro-jet into the line to blast any caked on sewage or debris with a high pressure hose. This process clears the line of all dirt and blockages, forcing all debris forward into the municipal line. This process can reveal roots, cracks, and other problems that may not have been visible on the first pass. Then a rooter is sent into the pipe, to trim existing roots, if necessary. At this point, any unique challenges that the job may pose should be known by our team. They are now ready for the next step. Once the inside of the pipe is clean, a special nozzle is sent into the sewer line, spraying the interior with our high-quality resin. The thick layer of resin adheres to the interior of the pipe, and afterward, compressed air is forced into the pipe, pushing the resin into every tiny crack. Once the resin hardens, it reinforces the pipe, forming a new pipe inside the old one. The new surface has less friction, allowing for waste to pass through more easily. And being completely air and water-tight, it will not allow roots to penetrate, and will also minimize corrosion, at least from the inside. The outer pipe will continue to accumulate cracks and holes, but being reinforced from the inside, it will old together for longer, and the cracks will not disrupt regular plumbing operations. It’s easy to see why trenchless technology has become an important option for countless property owners: the new line replaces the old one for conveying waste, and the old one becomes a shield, protecting the new one. The process only takes a few hours, and when it is finished, the lawn and property are in the same state they were in before the problem was discovered. But one word of caution: if you attempt to hire someone to perform this kind of operation, you definitely want a professional, who has the correct training and experience. If the pipe is not adequately searched or cleaned, or if the resin is applied incorrectly or in the wrong amount, you may end up with another problem years later. And you might not even realize that it came as a result of amateur work. The professionals at Knight’s have years of experience fixing sewer lines with this method. We have all been trained and certified by the manufacturer of the equipment, and we only use the best. Our video assist technology will allow you to see the operation for yourself, and when we are done, you will know that your line has been properly sealed. Our professionals are clean, well-groomed, and will take care to hear you out. You know your property better than we do – and we will make every effort to respect you by being punctual and efficient. We know that you have many options to choose from, and we will make sure to give you our best effort. If we give you bad news, we will make sure that you understand why. But even if the problem is bad, we promise you that we can still fix it. 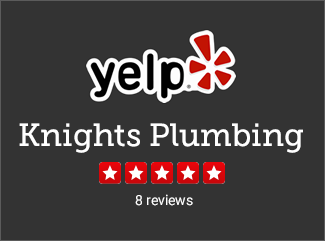 Knight’s Plumbing is centrally located in Orange County. No matter what your plumbing issue is, call us for a free quote. We can have our professionals to your home or office, no matter where you are in the county. We’re available 24 hours a day, every day of the week.